I came across a whole pile of papers from the Traffic Safety Association in the office paper dumpster last year. This ones my favorite. 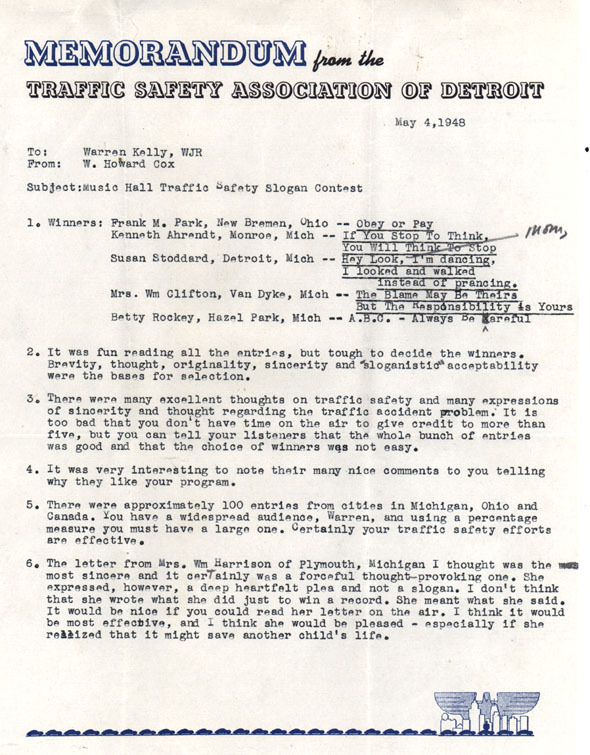 Hopefully its readable and pretty self-explanatory, but here are the basics: its a memo dated May 4, 1948 to radio station WJR. The two institutions had teamed up to hold a contest. The five lucky radio listeners who came up with the best traffic safety slogans were apparently awarded records. I wonder about Mrs. Harrison. Did she have a child that died in a car accident? Did she hit a kid with her car? At any rate, I hope someone read her letter on the air and gave that lady a record. Instead of prancing??!! That won?! ?